Developing novel, life-transforming medicines is only half the battle in drug discovery. Another key part is making sure that medicine goes to where it’s needed in the body, and can safely and effectively do its job—an area of research known as biodistribution. In recent years, nanoparticles have shown great promise to enable medicines to get to the part of the body where they can be safely best utilized. These miniscule materials, for example, can more effectively shuttle chemotherapy drugs to tumors while sparing healthy cells. Nanoparticles are custom designed to package and carry a medicine more precisely to where they’re needed in the body. But this technology is still in its early stages and there remains much work to be done to fully realize the potential. That’s why a multidisciplinary team of Pfizer researchers in biodistribution have recently joined forces to better understand how nanoparticles act as tiny medicine couriers. “We hope this research can influence the design of more effective nanoparticles by better understanding how they’re working in the body,” says Stacey Oppenheimer, Clinical and Translational Imaging Study Lead based at Pfizer’s Cambridge, Massachusetts research site. Read on to learn four areas scientists are studying to close the nanoparticle knowledge gap. A nanometer, by definition, is one billionth of a meter. This scale is used to measure the smallest of matter at the atomic level. Most nanoparticles are between one and 100 nanometers. By comparison, a single human hair is between 50,000 and 100,00 nanometers in width. For nanoparticles in medicine, size matters: scientists need them to be small, but not too tiny that they can squeeze between blood vessels and leak out of cells. Staying in the cell, once delivered, helps cancer-fighting medicine linger longer in tumors to do their job. Pfizer scientists are studying how varying the size of nanoparticles affects how well medicine can penetrate tumors and limit toxic side effects. These medicine delivery vehicles can sometimes be designed with special proteins on their surface, called ligands, which help it bind to specific targets such as cancer cells. Scientists are doing research to see whether using this targeted approach compared to a non-targeted method helps medicines more effectively reach a targeted site. The network of blood vessels feeding a tumor, called its vasculature, help determine whether it grows and thrives and how well medicines can reach it. 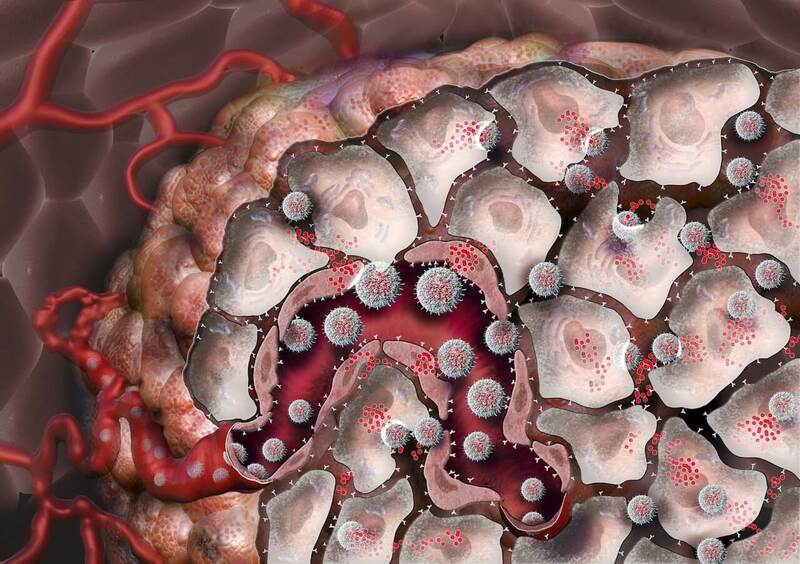 Scientists are looking to see if nanomedicines targeting not just the tumor, but its surrounding environment, can better fight cancer. Scientists are also working to develop more advanced tools to measure how well nanoparticles are doing their job, in real-time: if they’ve effectively reached the target tissue and delivered the medicine. One tool they’re working on is a PET (positron emission tomography) tracer that attaches a small radioactive tag to the nanoparticle to track where it travels in the body. “We can look at the distribution of the nanoparticle in the body in a way that’s non-invasive, and that can potentially translate into human studies,” says Oppenheimer. “This lends itself to doing studies without having to take tissue biopsies,” she adds. By bringing together researchers from various specialized areas, the team hopes to deepen the understanding of this nascent drug delivery technology. “What’s really novel about this group is that we’ve formed a cross-disciplinary team to focus on improving our understanding of nanoparticle delivery,” says Oppenheimer.